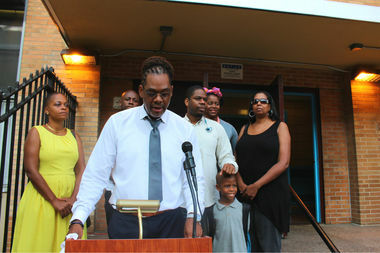 Councilman Robert Cornegy applauded the introduction of a new gifted and talented program at P.S. 26 in Bedford-Stuyvesant on the first day of school Thursday. BEDFORD-STUYVESANT — As the first day of school brought jitters and excitement, some families in the neighborhood were gearing up for another first — a gifted and talented program in the district. A pilot program kicked off at P.S. 26 in central Brooklyn on Thursday with a G&T class of 16 students, according to officials. Councilman Robert Cornegy, speaking on behalf of the City Council’s Black, Latino and Asian Caucus, welcomed students to the Malcolm X Boulevard school with high fives. “Today the Caucus continues its fight for education equity by congratulating the students in our newest gifted and talented classes for the 2016-2017 academic year, and calling on the Department of Education to strive toward socioeconomic parity by continuing to expand gifted and talented programming in high-need areas,” Cornegy said. In addition to Bed-Stuy’s District 16, the model launched in three other school districts that were also without G&T in past years — in the South Bronx and Ocean Hill/Brownsville. Instead of testing into the program, students were admitted on a variety of measures including attendance and demonstrated academic performance, officials said. G&T was a welcome addition for community members and families in Bed-Stuy who spent several years asking the city to bring it to the neighborhood. Still, some parents and officials had their reservations about the new model. “It’s a huge deal, we fought for it,” said Barnabas Uba Shakur, a member of Community Educational for District 16, a group that advocated for the program. Shakur transferred his 8-year-old son from the district’s high-performing Brighter Choice Community School to enroll him in the P.S. 26 program. “He got in and we’re really taking a leap of faith because he did really well in his original school,” he said. Cornegy said that he was “not thrilled with the implementation” of a third-grade start instead of kindergarten, but said that there were “merits” to the grade change, such as students having a better understanding of their surroundings and proper test prep. “In some districts where you see that they have 8, 9 and 10 gifted and talented programs, what they’ve done is created a pipeline to create more of what they like, more of what they intend. The Black, Latino and Asian Caucus’ goals are to increase minority participation in specialized high schools and gifted and talented programs across the city, Cornegy said, adding that they have partnered with community organizations such as the National Society for Black Engineers to provide students with other educational enrichment opportunities.